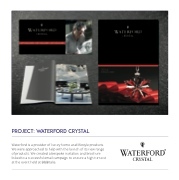 Waterford is a provider of luxury home and lifestyle products. We were approached to help with the launch of its new range of products. We created a bespoke invitation and brochure linked to a successful email campaign to ensure a high turnout at the event held at B&BItalia.